Having just come back from a wedding - in another part of the world - it felt appropriate to share with you White color inspiration from around the world. It comes courtesy of Ann Hurley, Woman of Wear-Dated and Ultron carpet fiber color expert, who lives and breathes color and product trends. White is the combination of all colors of light, and in our own culture it usually has an association with purity and innocence. In many westerns cultures white is the bridal color. Angels are garbed in white, and white hats always belong to the “good guys.” The dove of peace is always white. hana tsunami originally uploaded by ponkan. In Japan white cherry blossoms (Sakura in Japanese) are an enduring metaphor for the ephemeral [momentary] nature of life, and as such are frequently depicted in Japanese art. 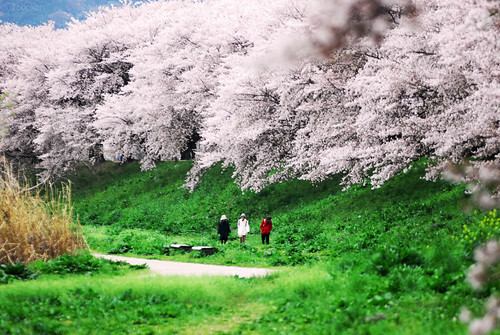 Life was considered brief and beautiful, much like a cherry blossom. Sakura, a well-known and ubiquitous symbol of Japan, is represented on all manner of consumer goods, including kimono, stationery, and dishware. Because of its purity, white is the color of mourning, funerals and death in many areas of Asia and in some African countries. In Japan a white carnation symbolizes death. In the Middle Ages mourning clothes were sewn from undyed cloth as a sign of humility. White alabaster was used to create Egyptian ritual objects such as vases, statues, and sacrificial offering sites, due to it’s lack of color. White was associated with cleanliness, ritual purity and the sacred and so it was the color of the clothes worn by the religious leaders in many cultures. Blue Door - White Wall originally uploaded by Klearchos Kapoutsis. 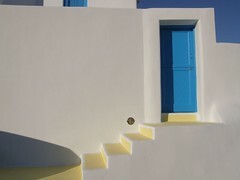 In Mediterranean countries, walls and often doorways are painted with white wash. The white color not only reflects the heat of the sun and visually guides a visitor to the entrance, but in Greece, too, white symbolizes purity. In the seventeenth century Europe, white was the symbol of truce or surrender – thus we know the white flag as the symbol of surrender today. Question: What color paper is used in Japan today to wrap gifts, and why? 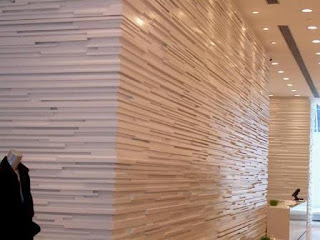 Answer: White – it symbolizes cleanliness. Check out the Wikipedia definitions of white. They are fascinating! About.com's Jacci Howard Bear - granted, in the desktop publishing section - describes how to use white [alone and with other colors], with links to Feng Shui Use of the Color White and White Plus 1 Color Home Decor Color Schemes. For previous posts in this series, see: Green Around The World and Red Around The World. Episode 2 of A Foot's Perspective comes from the city of Morelia in the state of Michoacan in Mexico. More specifically, it comes from my room at the Villa San Jose, a delightful hotel overlooking the beautiful and historic downtown of Morelia and located on a mountainside. I love Mexico, particularly the authentic Mexico that my friend Claudia - a former Woman of Wear-Dated [she helped us establish the Wear-Dated upholstery brand in Mexico when we in the upholstery business] - has helped me discover. Claudia has just gotten married. She honored me and my family by inviting us to attend her wedding. She even involved my daughter, including her with her nieces as a flower girl. In other words, she treated us like family! In so doing, she offered me an insider's perspective on family, hospitality and celebration in Mexico. Inspired by the experience, I share with you Episode 2 of A Foot's Perspective! For the previous episode of A Foot's Perspective, visit A Foot's Perspective - Episode 1. Earth Day 2008 gives us a chance to reflect on the whole notion of "green." Right now, green is the new "it" color. Actually, it's not so much a color as it is a way of life, an attitude about consumption and sustainability that currently sits heavily on many minds, and was considerably intensified last year by Al Gore and An Inconvenient Truth. A 1970s association with green comes from Kermit the Frog and his song 'It's Not Easy Being Green' where Kermit bemoans his greenness and lack of individuality. By the end of the song, he discovers green's many positive attributes and celebrates them. Interesting to be contemplating the many nuances and shades of green as Earth Day 2008 takes place. In a meeting last week, someone asked me if the whole green thing was just a fad: Would it go away, like the perms of the 1980s or the Macarana? My answer to that was no, green will not go away. Perhaps the hype will fade and the intensity will settle, but the environmental mindset is here to stay - too much depends on it. Someone else pointed out that, in addition, laws have been enacted in the past few years that regulate corporate accountability and sustainability in certain industries. Because of this, we can't exactly just forget about going green. With so much to consider, though, environmentally friendly living gets a bit overwhelming. As with the BBC - Two Show, "It's Not Easy Being Green", many of us want to do the right thing, but also realize how ineffective we would be without many of our modern day amenities. So how might we start? How might we take a first step or series of steps into making it easier to be green? That's where we step in: The Carpetology Blog would like to suggest starting small in that quest for a greener lifestyle. Because small steps can add up. They get you into the habit; they change patterns. For example, have you tried replacing a few incandescent light bulbs with CFL bulbs? You can even join Energy Star's Change a Light, Change the World campaign, like Ultron carpet fiber did at GreenBuild this year. We've also come across tips on caring for your house - and carpet - in a 'greener' way. For starters, take Care2's suggestion in a recent article and make your home a "shoe-free sanctuary." Adapted from Japanese Style, the article lists eight benefits of leaving your shoes at the door. "A healthier home is ensured because shoes track in lead, pesticides and other pollutants, contaminating carpets and floors, turning a home into a toxic place for pets and young children, especially, who spend more time on the floor," the article states. A recent Fort-Worth Star-Telegram article offers ways to "stay green while you clean," and suggests using natural products like baking soda, Borax, lemon juice and white vinegar - all inexpensive and accessible - to clean your home. Plus, each of these products has multiple uses: borax, for example, can serve as both a water softener and a laundry freshener. LighterFootstep, a website dedicated to helping people live a more sustainable lifestyle, specifically focuses on carpet cleaning. In order to avoid the chemicals many professional cleaners use, ask for a plant-based alternative. Or... "Postpone a general cleaning with spot maintenance. Here you have some natural options: salt for mud, dirt, and red wine; club soda for coffee stains; and cornstarch or cornmeal for grease. To control odors, liberally sprinkle carpeting with baking soda and allow to sit overnight before vacuuming. Direct sunlight is also a great deodorant. A couple of hours in the sun does wonders to freshen bathroom mats and area rugs." Heloise offers wonderful baking soda suggestions. As it relates to deodorizing carpet, she says: "Put baking soda in a clean spice container, or clean plastic Parmesan cheese container with a shaker top, and lightly sprinkle it all over the carpet. Leave on for at least 30 minutes and then vacuum. If you want a spicy carpet deodorizer, add a little cinnamon spice to a shaker filled full with baking soda. Sprinkle on the carpet, let sit for a bit and then vacuum. CAUTION: The dark-colored spices could stain, so don’t use on white or light colored carpeting." When asked about options for environmentally friendly professional carpet cleaning services, National Geographic's The Green Guide discusses the chemicals found in many carpet cleaning solutions, talks about why they're harmful, then suggests hiring companies like Bi-O-Kleen that use plant-derived cleaners instead of detergents. The guide offers a variety of tips for carpet cleaning, as well as some home remedies to remove common household stains. "For a heavy duty carpet cleanser," the guide suggests, "take 1/4 cup each of salt, borax and vinegar and mix to form a paste, then rub onto carpet. Follow by vacuuming the spot thoroughly. It even offers a shopping list of good green products." Note: our expert strongly suggests that you test a small area first before applying the salt/borax/vinegar paste onto your carpet. Her research indicated that although excellent at killing fleas, salt and borax in particular can be particularly abrasive and might damage your carpet. Also, don't underestimate the benefit of vacuuming your carpet regularly [i.e., at least once a week], and more frequently if you desire. For high traffic areas, go over the same area multiple times in different directions with the vacuum. And, do make sure that the vacuum bag doesn't need to be replaced before you do your cleaning! So, as Kermit discovered, don't be intimidated about what it takes to be green. Just take it step by step, start with what's comfortable, and realize that in reality, it's a lot easier being green than you might have thought! Some of you may already know Ann Hurley, Woman of Wear-Dated and Creative Manager, Product & Color for Solutia Inc., involved not only in Wear-Dated, but also our Ultron contract carpet fiber division. If you aren't familiar with her, you are in for a treat! That's because Ann Hurley is the most creative and colorful person I've met. And, whenever I spend time with her, I am guaranteed to walk away with a renewed perspective on color, pattern, texture, food, trends, fashion, carpet... and creativity. For example, not only does she take terrific photos, do serious gardening, and design clothing, fabric, jewelry and carpet, but she also avidly supports Chattanooga's Wine Over Water event, regularly entertains like minded creatives - attending local art shows with them - cooks feasts, arranges flowers, takes part in fiber art/quilting [she's currently making 4 t-shirt quilts -see picture below - for graduating high school seniors], develops the most inspiring trend boards ever, and constantly searches out intriguing colors and dyestuffs, as she treks around the world attending trade shows as diverse as NeoCon and Heimtextil. Did I mention that Ann knows color? Actually, she really knows color! She actively participates in The Color Marketing Group (CMG) - she's done so for more than 20 years - and now has a 'reputation' that comes from her active participation and that she is a chairholder and has served on the board of directors. She's also a member of the Color Association of the United States [CAUS]. Oh, yes! Our Ann is known as one of the industry’s leading experts on color. No surprise, Ann applies her color expertise to Solutia's yearly color forecast for Ultron and Wear-Dated, and her creative development knowledge to the relations she weaves with our carpet mill partners. She has also contributed the following to Flooring The Consumer : Ann Hurley's Trend Insights - 2008, What is Blue?, and Managing Consumer Expectations and to The Carpetology Blog: Red Around The World and Green Around The World. You can definitely expect more! Ann graduated from the University of Tennessee with a B.S. in Fashion Merchandising / Interior Design. 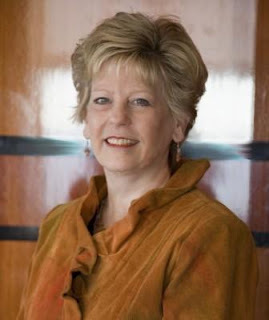 She is a featured guest lecturer at ASID, IIDA and IFMA functions, as well as in the college classroom. Despite all of this, I get the sense that Ann stays grounded through her garden and the hospitality that her garden enables. 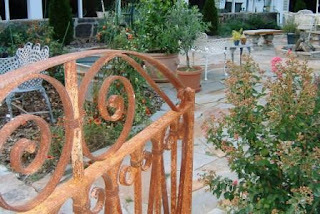 As I'm writing this, she informed me that it's gardening time in the South and she has already planted broccoli, cabbage, romaine lettuce and spinach and a variety of herbs [see gate picture]! One of her favorite summer recipes is "black eyed pea dip/salad" that is great as an appetizer or as a salad with any grilled meats or veggies [I haven't yet tried it, but plan to!]. Best enjoyed in the company of many wonderful friends! So, if you admire creativity as much as I do, don't miss her! Perhaps you've heard of Project Runway. It's an obsession just a bit smaller than American Idol that seems to monopolize any free time available in this country. Tim Gunn, Heidi Klum and an assorted cast of aspiring designers have made fabric, sewing and design suddenly very... fierce. 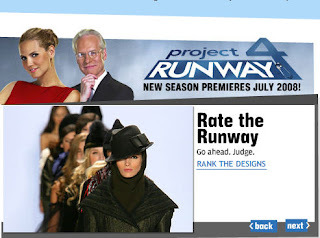 So it's not surprising that a plethora of Project Runway-like fashion contests are popping up all over the country. One of them, located in Seattle and dubbed Product Runway, challenges leading design firms and students in the area to create garments from manufacturing materials, including upholstery, lighting and even... carpet! But events like this aren't simply vapid attempts to flaunt all things superficial (maybe just a little); they usually support a cause. In the case of Product Runway, all proceeds go to the Interior Design Coalition of Washington, a group that seeks the recognition of the interior design profession to protect the health, safety and welfare of the public. If you're in the Seattle area, Product Runway takes place on May 2, 2008, at the South Lake Union Naval Reserve. If you can't make it, check out some design inspiration for the contestants. Each participating design team was randomly paired with a manufacturer, then had just under four months to finish their garment. The teams will participate in the final runway event complete with cocktails, hors d'oeuvres and plenty of people watching. But clothing made of carpet isn't the half of it. Have you ever seen carpet made of clothing? Silke Wawro, a German designer, developed a scrap clothing carpet which at one time, was available for purchase off of a giant roll. The carpet was seen as a fabric journal, created to represent all of the clothing used during a person's lifetime. At the same time, it also gave a nod to sustainable, reusable design. Although her Web site is no longer available, you can still see the clothing carpet here and here. So there you have it. Wearable carpet and floorable clothing. The industries will never be the same. The Women of Wear-Dated like to look at the world - and carpet - somewhat differently. Whenever possible, we like to take the foot's perspective in evaluating life, beauty and carpet. 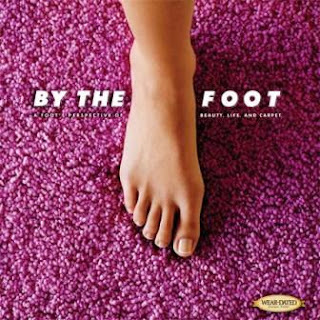 In fact, that's the approach we've taken with Wear-Dated's By The Foot marketing campaign as Marianne Cone explains in "Feet Appreciate Beauty." The brochure itself is one foot square in size. The brochure cover is textural, inviting the hand [or the foot] to feel it. Carpet - from the perspective of the foot - is absolutely the star. I'm really taken with the concept and the visual nature of By The Foot [yes, I am a visual thinker]. It's also a fantastic conversation starter with retailers and retail salespeople to get them thinking about how sensual a product carpet is, and how it can enhance our lives as consumers both in terms of expressing our individuality and stylishness, and as a comfortable foundation for living. So, inspired by my friend Matt Dickman, Techno/Marketer extraordinaire, with a dose of unusual perspective from the Upside Down Show, I share with you Episode 1 of "A Foot's Perspective" brought to you by The Women of Wear-Dated direct from midtown Manhattan. Wear-Dated Natural Nylon carpet fiber makes for really stylish carpet. Since I'm biased, you shouldn't just take my word. Check it out for yourself. What is it you ask? It's our latest Nylon 6,6 carpet fiber brand extension [the last one was DuraSoft], and we're excited about it. We introduced Wear-Dated Natural Nylon at Surfaces 2007. 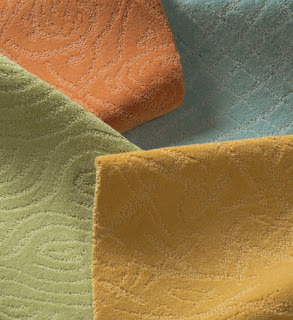 This past Surfaces 2008, we showcased a fun range of new carpet styles [see Marianne Cone Discusses Surfaces, By The Foot and Wear-Dated Natural Nylon], many of which you can find in carpet stores now. I have heard people mumble "Natural Nylon - that sounds like an oxymoron." That's okay because it gives me the opportunity to explain why this product is so exciting, so technologically advanced and so worthy of the name Wear-Dated Natural Nylon. Wear-Dated Natural Nylon refers to Nylon 6,6 carpet fiber that is combined with our proprietary insert technology. The resulting fiber generates a carpet with the look and feel of wool, yet with the durability of Nylon 6,6 - the best nylon available for carpet. The name came out of consumer focus groups. Consumers [primarily women] told us that "Natural Nylon" best captured the look, feel and elegance of the carpet samples they touched, felt and interacted with [see photo above]. So, we went with it. It tells a story. Wear-Dated has a reputation for durability. So, when we realized during the product development process that Wear-Dated Natural Nylon improves on the superior performance characteristics of nylon 6,6 -- with a natural look and feel -- to deliver an even better carpet, we were really excited! Here's how it works. The proprietary insert technology process literally inserts a low-melt nylon fiber in between the yarn plies. During manufacturing when heat comes into play, the low-melt nylon melts, binding the yarn together. The result: tufts that cannot be untwisted. This creates a carpet end product that has better resistance to matting [i.e., great performance], and better tip definition [i.e., that means you can create some unusually fashionable carpet styles]. It also means that staple yarn [i.e., the yarn normally associated with traditional textured carpet styles] can now go into carpet constructions that up-to-now were only possible with BCF yarn [i.e., the yarn that creates loop and pattern carpet styles]. So the variety of pattern and styling possibilities become endless! And the look and feel is more wool-like than ever. Which makes us very happy because we can offer consumers [thanks to carpet mills like Karastan, Mohawk and Gulistan] a gorgeous range of carpet patterns and colors that deliver beauty, comfort and durability -- with the natural beauty of wool and the incomparable performance of Wear-Dated nylon carpet fiber. I've attached a slideshow to visually explain what makes Wear-Dated Natural Nylon different. + Starting at the top left corner you see a bundle of Wear-Dated Natural Nylon carpet fiber. + Move to the top right, and you'll notice a larger view of that bundle with closeup of the tips of the fibers. + The bottom left photo goes closer yet to show you the insert fiber. + Finally, the bottom right photo goes even closer to show you the insert fiber bound together with the individual Nylon 6,6 fibers in a "between-ply fusion." 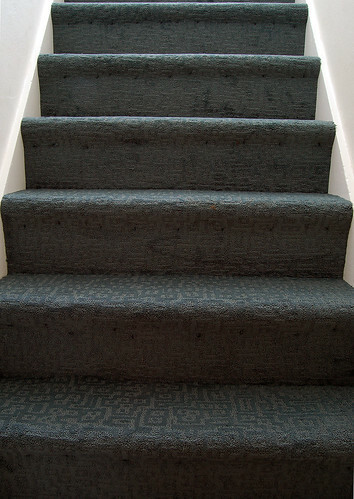 The Latest in Carpet Style Trends shows you specific examples of carpets made with Wear-Dated Natural Nylon carpet fiber. As others become available, I'll be sure to let you know, too! I promised in Pray Tell: What is a Frieze Carpet? to tell you more about Shag and Cable carpets. 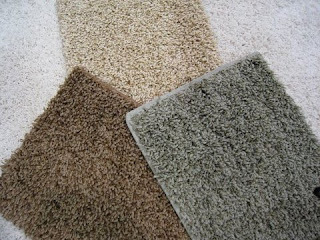 To recap, all three are part of the 'Twists" subcategory of textured carpet. They are sometimes also referred to as casual textures. Let me share with you what I discovered about shags and cables! Did you know that shag refers to specific swing dances like the collegiate shag, the Carolina shag and the St. Louis shag? There's also the 1989 movie called Shag. And a bird related to the cormorant. There's the artist called Shag [Josh Agle]. There's of course the term made famous by Austin Powers. But, I found that shag or rolling tobacco reminds me most of shag relating to fabric and carpet. I wonder whether perhaps that isn't the origin of the carpet style. Bolder and more stylish than what you remember, the new shags often combine a variety of yarn thicknesses and textures to make a trendy and bold design statement in your home. That to me is what makes the shag carpets available today so much more luxurious and fashionable - and fun! - that what I remember as a kid. Check out these links with additional photos of shag carpets. The second describes the yarns in a shag as "slightly twisted, with much less twist than the frieze. The individual yarn strands are longer and spaced further apart as opposed to the Saxony, Textured and Frieze Cut Pile Styles. The shag gives a "grass type look" because the strands lie in different directions." The Shag Carpet Company has some more unusual images of shag carpet with fabulous combinations of colors. Now, even though Shag Carpet - Groovy Events & Decor describes a certain nostalgic association for shag, the new shags capture exciting textures and luxurious fashions. The most wonderfully extreme shag is Tuftex's My My My or Super Chic [pictured above]. Cable carpet [according to the Wear-Dated page above] is characterized by fat, nubby yarns that lend a touch of luxury to a casual setting. Some of the examples I have pictured here include Horizon's Melrose Place and Flamboyant [also described in The Latest in Carpet Style Trends]. In researching cable carpet, I did come across some unexpected interpretations. This certainly Gives new meaning to Cable Carpet and then there's Cable Carpet Helps You Hide the Evidence of Your Geekyness. I admire the practicality of these two cable carpets, though. Don't you? However, I truly prefer the stylishness of real deal cable carpet, and hope that the shag and cable carpet styles I've described above inspire you to have fun with carpet! Important Care Information: Please note that in caring for Shag and Cable carpets [we will address this in more detail in a separate post], neither shags nor cables - particularly very long - like vacuums with beater bars. Much better to use a suction only vacuum cleaner with no beater bar to prevent the carpet from wrapping around the beater bar – which can create fuzzing.